Post It With Banner Ads. What a great idea from the folks at Proximity Russia for 3M. Banner ads that actually make you want to use them, remember the product, and share with others. Love it. Anthroposts. The Anthropology of Post-It Notes. My younger brother is an anthropologist so I am dedicating this post to him. The ultimate destiny for a post-it note is the trash bin. It is part of the inevitable cycle of the small paper reminder, note, name, number, cheat sheet, or doodle. The humble post-it note is ephemeral by design. There is however, someone who is collecting them, archiving them, and cataloging found post-its. Anthroposts is a cool little website that gathers up found post-it notes and organizes them by their color, use of common words and the complexity of the note itself. When the notes are organized by common words, the site shows a visual interconnection of how the notes are related. The site features a soundtrack of all their where the notes are read out loud and combined with background noise and music. Each note is clickable so that you can see it full size and experience the original handwriting, doodles, and notes in vivid detail. Posted in Design and Art, Technology and tagged 3M, Anthropologist, Anthropology, Anthroposts, Doodles, Drawings, Ephemera, Post Its, Post-It Notes, Words on February 7, 2013 by Author. With all the advances that have been made in decal wraps for vehicles over the last 10 years, I am surprised we don’t see more of this kind of stuff. 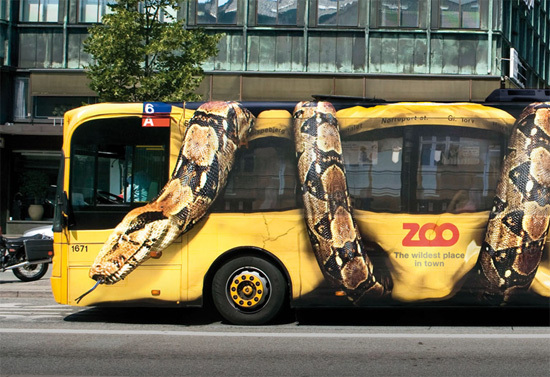 This is a really nice ad for the Copenhagen Zoo, executed by Packsaddeled Y&R under the art direction of Peder Schack. This is such a great use of full bus graphics, and in the photos it really has a dimensional quality to it. I bet this looks even better at night. 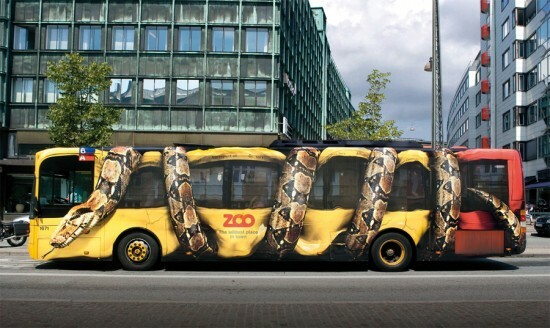 Posted in Advertising and tagged 3M, 3M Decal, Copenhagen Zoo, Packsaddeled Y&R, Peder Schack, Y&R, Zoo Bus on September 7, 2010 by Author.